"To go to the U.S., perform and bring Israeli culture to American audiences is important to me,” Kleinstein says. Pico Union Project and the Israeli American Council are proud to present: legendary Israeli artist, Rami Kleinstein! 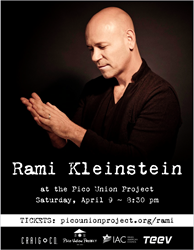 Rami will be performing live at Pico Union Project On April 9, 2016 at 8:30pm. Triple-platinum selling artist, Rami Kleinstein, was originally born in New York. At the age of eight, Rami’s family moved to Israel. "To go to the U.S., perform and bring Israeli culture to American audiences is important to me,” Kleinstein says. "I tell them stories about Israel, about myself and my aliyah." Rami has written music with American icon Bob Dylan and weaves together American and Israeli cultures by writing his own lyrics to popular American songs. His soothing piano playing and love ballads often garner comparisons to Billy Joel and Elton John and he is considered one of Israel’s greatest composers. The evening will begin with a performance by special guest, Ronny Weinrich, an Israeli/American artist based here in Los Angeles. Ronny was born in Tel Aviv and served as a tank commander in the IDF. He was injured in Lebanon—an experience which ultimately gave rise to his musical career. Ronny’s songs reveal raw and humbling insight into the human experience and span across the musical genres of rock, pop, and soul. Prior to becoming the Pico Union Project, 1153 Valencia Street was home to the first Jewish synagogue in LA before it became a Welsh Presbyterian Church. Craig Taubman bought the vacant building in 2012 and decided to launch Pico Union Project: a multi-faith, multi-cultural arts center. He has put significant energy into revitalizing a Jewish presence in the neighborhood while simultaneously encouraging those of all faiths and cultures to come and experience stellar musical acts. Rami Kleinstein joins other notable Israeli artists such as Noa and Baladino in gracing the stage at the Pico Union Project’s Sanctuary. Erez Goldman, Regional Director at Israeli American Council Los Angeles says, "The IAC loves partnering with Pico Union Project in bringing the Israeli-American community together around music and culture. The venue is such a unique place and Craig Taubman is an ideal partner for us. We're looking forward to a memorable evening and many more collaborations."